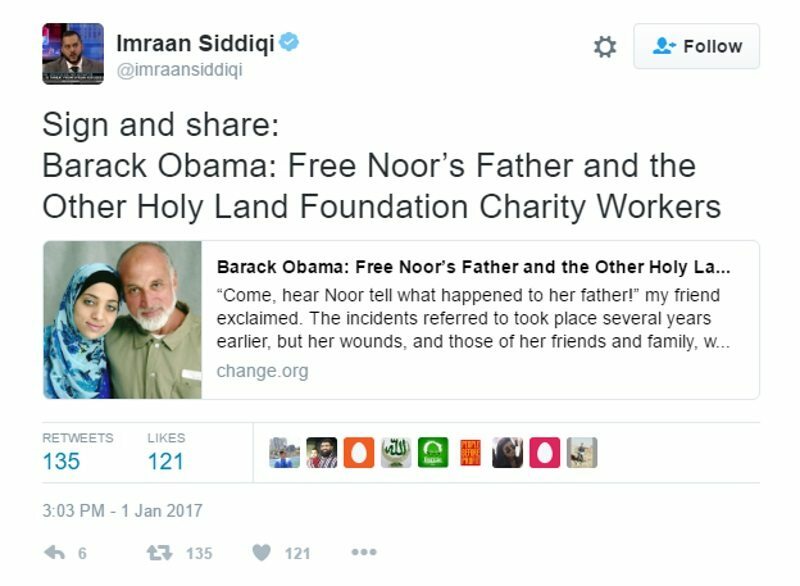 A new petition, started by a Council on American-Islamic Relations (CAIR) leader, is calling for outgoing President Barack Obama to issue a pardon for those convicted in the largest terror financing trial in American history. A petition calling for President Barack Obama to use his powers of clemency to secure an early release for terror financiers is circulating online. It gained the support of Imran Siddique, the executive-director of the Arizona chapter of the Council on American-Islamic Relations (CAIR), the Clarion Project reported. CAIR is designated as a terrorist organization itself, by the United Arab Emirates, as it is linked to the Muslim Brotherhood. The trial was the largest terrorism financing trial in American history. Five senior executives of the Holy Land Foundation, at the time the largest Muslim charity in the United States, were convicted of funneling millions of dollars to Hamas in 2008. An earlier trial in 2007 was declared a mistrial, and an appellate court upheld the sentences in 2011. CAIR itself was listed as an unindicted co-conspirator at the Holy Land Foundation trial, a designation which was upheld by a judge despite a legal appeal launched by CAIR to have it removed. Read more about the Council on American Islamic Relations (CAIR). Clarion Project has an archive of the documents from the Holy Land Foundation trial. In 2007, CAIR was named as an unindicted co-conspirator in the Holy Land Foundation (HLF) trial, a Hamas financing case that would result in the FBI ceasing its working relationship with CAIR. The HLF trial was the largest terror-financing case in American history. And yet, this radical Islamic organization continues to operate in the United States. Next articleChurches Burning Throughout Europe & Mid East; Jihadi Rapists On The Rise. Loose. Americans, Watch Out!